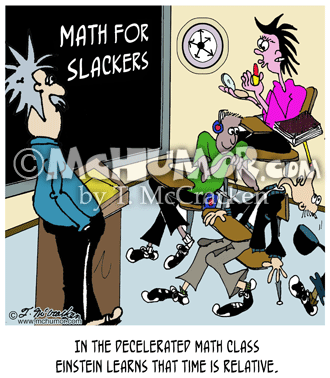 Math Cartoon 7548: Einstein in front of a bunch of slackers in a classroom who aren't paying any attention. "In the Decelerated Math Class Einstein Learns that Time is Relative." Insurance Cartoon 8949: Einstein fumbling with forms says to someone, "I can explain the Theory of Relativity, but I can't figure out which is the best Medicare Plan." 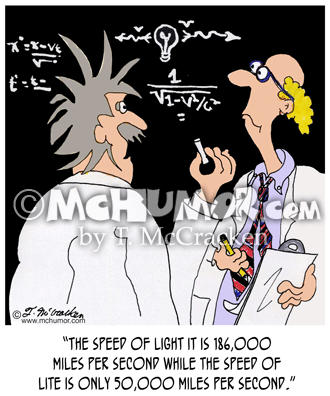 Physics Cartoon 6526: Scientist saying to another, "The speed of light it is 186,000 miles per second while the speed of Lite is only 50,000 miles per second." 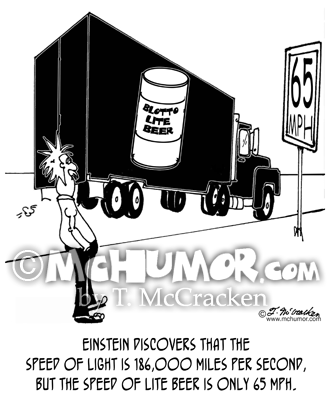 Truck Cartoon 6054: "Einstein discovers that light travels at 65 MPH." 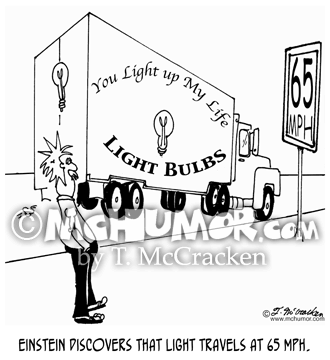 Einstein is on a highway when a truck transporting light bulbs drives by. 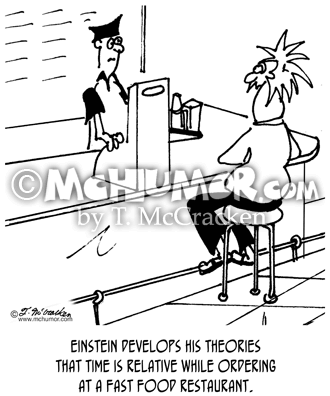 Fast Food Cartoon 6051: "Einstein develops his theories that time is relative while ordering at a fast food restaurant." 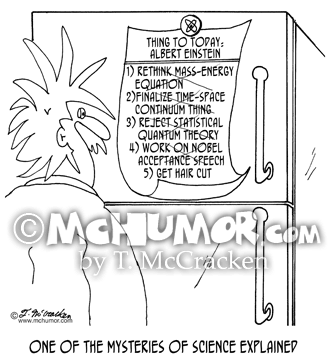 Einstein Cartoon 5365: “One of the Mysteries of Science Explained.” On a refrigerator is a list: "Things to do Today, A. Einstein." 1) Rethink mass-energy equation. 2)Finalize time-space continuum thing. 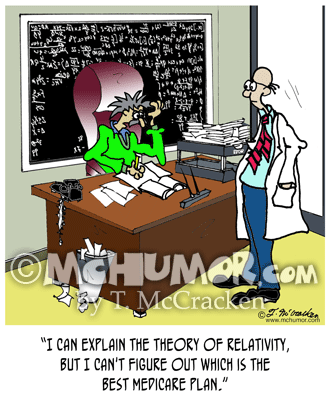 3) Reject statistical quantum theory. 4) Work on Nobel acceptance speech. 5) Get Hair cut. All but the last are crossed off. 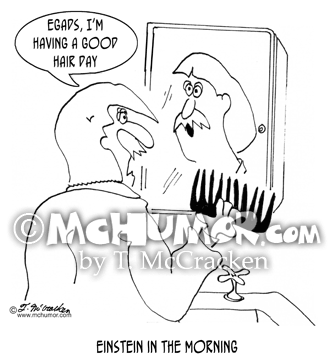 Einstein Cartoon 6740: Einstein in the Morning. "Einstein with combed hair looks in the mirror and says: "Egads, I'm having a good hair day." 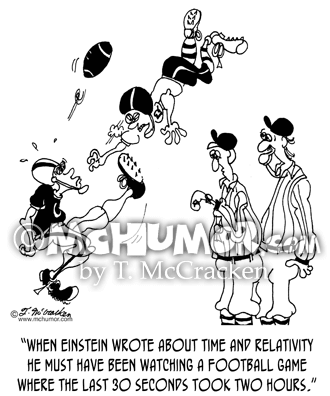 Football Cartoon 6639: A referee saying to another, "When Einstein wrote about time and relativity he must have been watching a football game where the last 30 seconds took two hours." Beer Cartoon 9069: "Einstein discovers that the speed of light is 186,000 miles per second, but the speed of Lite beer is only 65 MPH." A beer truck drives on the highway. 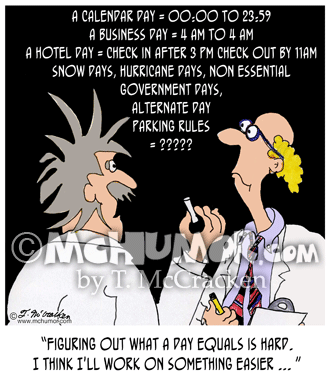 Time Cartoon 8392: Einstein at a black board with various day permutations on it: A calendar day = 00:00 to 23:59, A business day = 4 am to 4 am, A Hotel Day = Check in after 3 pm check out by 11am, Snow Days, Hurricane Days”, Non Essential Government Days, alternate day parking rules He says, "Figuring out what a day equals is hard. I think I'll work on something easier ... "